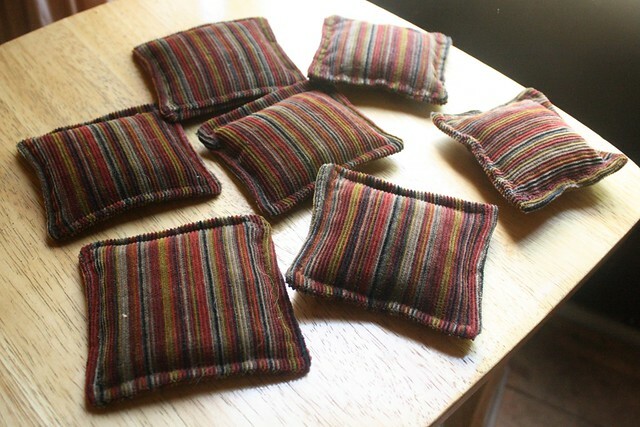 i upcycled these from a corduroy blazer. i could eek out 4 1/4 " squares of material for enough to do just these. (i had already used the sleeves for pants!) two have different edging stitches. (which merely made them wonkier, i think, so i made the rest straight-seamed.) one is also stuffed a bit more, but the rest we weighed out to 2 oz. of pinto beans each. we made sure to put lots of love in as well.